The work crew from New Hampshire and some GCW staff, on the completed floor. Thanks to Allison for this photo. 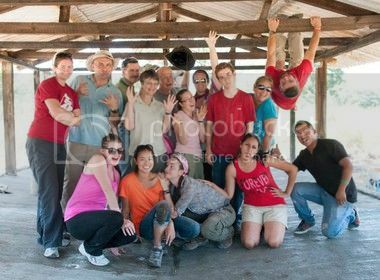 In July 2014 my wife and I joined a group of 8 others for a project in association with Global Community Works (gcworks.org). Special thanks to Dave (back row, with the black hat) for leading and organizing the trip. Global Community Works is committed to working with marginalized communities in the developing world, partnering with them to gain access to resources out of the poverty trap. Through our direct contact with these communities, direct impact is made for a better life through sustainable solutions that work. In planning this trip with GCW, we agreed that the most suitable role for Dave's team was to help in supporting their goat and coffee initiatives. This writeup summarizes the background, needs we were trying to address, and what we were able to accomplish. And a brief message from our sponsors: GCW sells the coffee to support the work and the farmers that grow it. See below for more info about their online store. 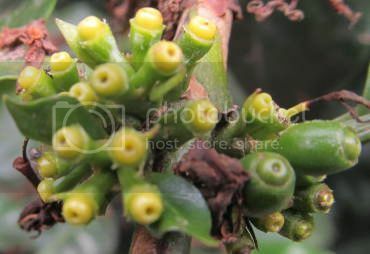 Healthy coffee beans in pods on a coffee bush. “Coffee Rust” is a fungal disease that is wreaking havoc on coffee plantations in Guatemala and other parts of Central America[RUST]. Estimates of the financial loss are in the $1 billion range for Guatemala alone[NPR]. Many people believe the resulting economic hardship is a contributing factor to the current influx of unaccompanied children to the United States. According to the experts ([APSNET] for example) copper-based fungicides can control it, but cost is an issue and copper buildup in the soil creates other long-term problems. Fertilization strengthens the plants and helps them survive an infestation. Commercial chemical fertilizers typically supply some mix of nitrogen(N), phosphorus(P), and potassium(K) — nitrogen and phosphorus help the plants survive rust, but excessive potassium actually makes things worse [APSNET]. Urine is an excellent source of nitrogen with little potassium [ORGFERT] so it makes a excellent starting point for treating coffee plants. It's also abundant where farm animals are present, so it is a low cost organic way to reduce the need for expensive chemical fertilizers and fungicides. GCW has been actively working with local Guatemalan coffee farmers to combat the rust. My understanding is that they process the urine in some way to make it more effective as an anti-rust treatment. I haven't found any online details about this treatment; if you're interested in the biology and chemistry aspects I suggest checking the [GCW] website directly. 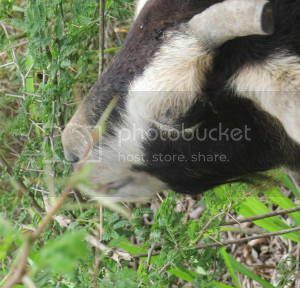 This goat was happily munching on a bush with inch-long thorns on it. We called it the toothpick bush and kept a respectful distance. Being smaller, they require less initial investment by the farmer (less land for feed, less space for shelter, and lower cost for initial purchase). They reproduce faster, yielding increased income potential. As browsers they eat bushes and shrubs, so can make use of food sources not suitable for cattle or sheep. 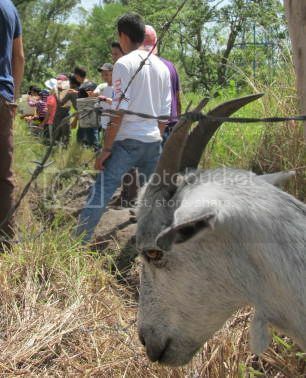 The photo to the right is an illustration of the latter: this goat was happily browsing on a thorn bush and various other overgrowth near the work site. GCW has been working with a local government-run boarding school ([ENRO]) to acquire goats and build a goat shelter. The goats will provide milk and meat for the school; they also allow the school to teach about managing and caring for animals. As the students graduate they can then carry this knowledge to benefit other parts of the country. 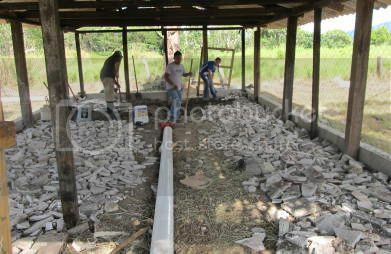 GCW, ENRO, and other work teams had already obtained some goats, cleared land, and refurbished an existing structure for use as the goat shelter. Our primary objective was to develop and implement a plumbing system to collect urine for the aforementioned coffee rust treatment. A secondary goal was to install a fence to protect the goats from stray dogs and other predators. Early in the construction process, pipe and "gravel" layer in place. After selecting the waste-collection system as our project we first did some research on existing designs. Urine and manure are useful as fertilizer, so many folks have looked at various solutions. However, a Google search quickly showed that most ideas are designed for large, highly mechanized first-world farming operations. We quickly narrowed the options down to a few that looked feasible for a small-scale operation. These candidates are summarized in our GoateryPublic document. GCW and Guatemalan contractors chose an approach similar to the "indiawater" design: the shelter has a V-shaped sloping concrete floor with a perforated PVC pipe buried in the middle of the "V" as a collection tube. The pipe leads to a sump at one end of the shelter. 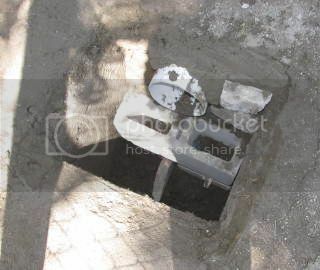 A bucket can be placed in the sump under the end of the pipe for collection purposes. 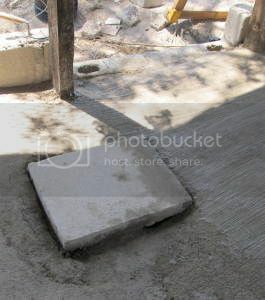 A cast concrete cap covers most of the sump, hopefully keeping most solid waste out of the collected liquid. The resulting structure should be rugged and relatively simple to clean and maintain. Construction made use of low-cost locally-available materials (sand, gravel, cement), so it can be easily copied, improved, and adapted by others in the area. Transferring water from the well to the worksite. The first day was spent laying a base of gravel (and broken tiles from a previous demolition project) and sand. Students from the school were a big help in transporting materials. The school had trucks, tractors, and a wagon to use for transportation, but the final 100 feet of so had to be moved manually. The second day we mixed and poured concrete for half of the floor. A complication was that the school's water pumping system was non-functional, so we had to transport water from the well to the work site also. Half-complete floor, sloping toward the center. The third day we poured the second half of the floor and began digging post holes for a metal fence to surround the shelter. The fourth day we dug some more holes in the morning, and went to see one of the coffee farms in the afternoon. Collection hole and its cover. The concrete block in the upper photo is only to hold things in place while the concrete sets. At the end of the week, the floor was complete, the pipe was in, and the collection well was complete. We're waiting to hear reports on how well the system works. The GCW coffee store is gcwcoffee.highwire.com/products/coffee. Personally, I prefer the medium roast. According to the aficionados, a medium roast preserves much of the unique flavor of the beans. A darker roast is stronger but the flavor is more that of the roasting process itself. So why buy a unique coffee to get the flavor of the roasting? YMMV. [GOAT] GoateryPublic.htmlLiterature survey on goat shelters and urine collection. [RUST] http://en.wikipedia.org/wiki/Hemileia_vastatrix Wikipedia on Coffee Rust. [APSNET] www.apsnet.org/edcenter/intropp/lessons/fungi/Basidiomycetes/Pages/CoffeeRust.aspx Treatment options for the rust. [ORGFERT] extension.oregonstate.edu/douglas/sites/default/files/documents/lf/orgfertval.pdf about the properties of animal waste as fertilizers. [GCW] gcworks.org Global Community Works website. [JAVA] gcwcoffee.highwire.com/products/coffee. GCW Online coffee store. Make comments or ask questions at my blog post: sensicomm.blogspot.com/2014/08/goats-and-coffee.html . I'll respond as I can and as time permits. Photos by Joe or Ginny Rothweiler, except as noted. This page first published August 21, 2014.